IMPACT Exhibition Management Co., Ltd. (“IMPACT”), strongly supported by the Ministry of Public Health, as well as numerous medical and healthcare related, presents Medical Devices ASEAN 2018 (“MDA 2018”) - the international exhibition and academic congress on medical devices, technologies, services and general healthcare. This trade exhibition features a comprehensive range of products and services, including general surgery; orthopedic surgery and rehabilitation medicine; radiology and diagnostic imaging; medical laboratory; IT in healthcare; and medical instruments and consumables. More than 150 exhibitors and 4,000 medical and healthcare professionals are expected to attend the three-day event. 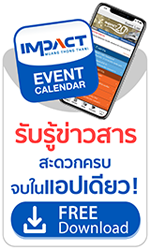 The event will be held from 11 to 13 July 2018, at hall 1-2, IMPACT Exhibition Center, Bangkok, Thailand. SILMO Bangkok 2018, the first dedicated trade fair for the optical and eyewear industry in ASEAN, is set to make its debut in Bangkok, Thailand. Bangkok, Thailand 31 May 2018 - SILMO Bangkok 2018 presents a new chapter in ASEAN's optical and eyewear industry, providing a platform where manufacturers, dealers and distributors in the optical industry, are able to explore the current sales and marketing trends to drive business growth. SILMO Bangkok 2018 will take place at Hall 4, IMPACT Exhibition Center, Bangkok, Thailand from 20 to 22 June 2018. The Metropolitan Electricity Authority (MEA) aims to drive the country towards Thailand 4.0 and to become the world’s next mega-city. More than more than 250 exhibitors from Thailand and the rest of the world are showcasing the latest innovations in lighting, LED products and PCB at the three-day trade event, from 10 to 12 May 2018, at Challenger 1, IMPACT Exhibition and Convention Center, Bangkok, Thailand. More than 15,000 trade visitors are expected. Novotel Bangkok IMPACT has adopted refugee centres under the Thai Committee for Refugees Foundation for the Linens for Life™ programme, in partnership with Diversey. The hotel donated 2 tonnes of used linens for recycling to help meet the needs of local communities. Its objectives are three-fold: to help with immediate disaster relief efforts; to provide livelihoods to the local community through recycling; and to help hotels reduce waste. Manorah Thai Restaurant offers delicious, quality Thai fusion food and catering service for all types of events. Bangkok, Thailand, 26 April 2018 - Metropolitan Electricity Authority (MEA) is pleased to be the host organisation of the 6th edition of LED Expo Thailand 2018 (LED Expo 2018), ASEAN’s largest exhibition on LED products and technology; and the 3rd edition of PCB Expo Thailand 2018 (PCB Expo 2018), ASEAN's largest and only exhibition on printed circuit board manufacturing and electronics assemblies. These two trade exhibitions are organised by IMPACT Exhibition Management Co., Ltd. and MEX Exhibitions Pvt. Ltd, and will take place at Challenger 1, IMPACT Exhibition Center, Bangkok, Thailand, from 10 to 12 May 2018. Huge crowds will be flocking to IMPACT Muang Thong Thani this weekend to attend several big events. IMPACT prepares to facilitate Triam Udom Suksa School's entrance examination which will take place on Sunday, April 1, 2018 with more than 10,000 applicants. To provide the utmost convenience for students and parents attending the exam as well as those attending Bangkok International Motor Show, Robinson Shop Mun Sanun Muang and Disney On Ice, IMPACT will provide rest area and parking spaces at Hall 6-8 from 5 am onwards in addition to indoor and outdoor parking spaces that can accommodate up to 15,000 vehicles. Traffic facilitation center and 24-hour hotline 0-2833-5445-7 are set up to provide updates on traffic conditions in Muang Thong Thani area. IMPACT Exhibition and Convention Center declared the occupancy rate of both inside and outside catering from the end of the year 2017 until early next year which features over 164 events including party, wedding, private and corporate New Year party of all sizes, resulting in a higher occupancy rate of 20 percent compared to the same period last year.